The proposed Rock Creek mine has been a threat to the Cabinet Mountains Wilderness for almost thirty years. The proposed project and the anticipated impacts to the regions wild country, wildlife, and clean water are, unfortunately, not unique. 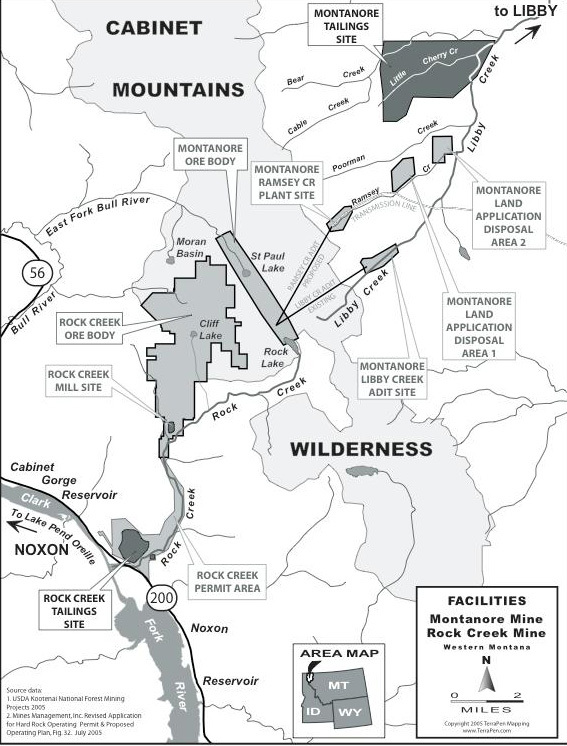 While Rock Creek receives most of the press, the proposal is but one of several mines seeking the ore beneath and adjacent to the Cabinet Mountains Wilderness. In 2008, the Montanore mine was resurrected after being abandoned for many years. Although previously permitted, it was never built due to low metals prices. Its new owners are seeking a new permit and Montanore once again poses a serious threat to the Cabinet Mountains Wilderness. Approximately 19 additional patented mining properties occur in the region of the Cabinet Mountains Wilderness. If constructed, these projects would have a significant impact to the wilderness ecosystem. Considered singularly, these mining projects threaten water quality, fish and wildlife, and solitude. Their cumulative impacts would result in the demise of the Cabinet Mountains Wilderness. The proposed Montanore mine is an underground copper/silver project 18 miles south of Libby, Montana that would be constructed on lands in the Kootenai National Forest. 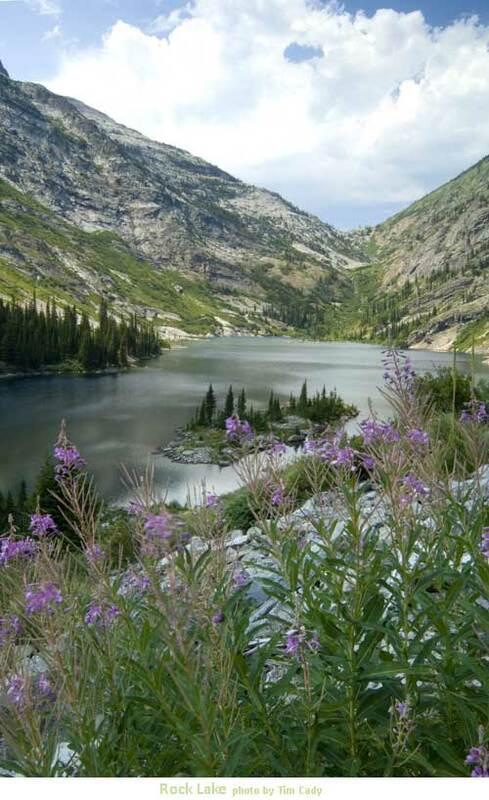 Similar to the proposed Rock Creek Mine, Montanore would extract ore from beneath the mountains, meadows, and alpine lakes of the Cabinet Mountains Wilderness. The Montanore mine would have significant impacts to Rock Lake (see maps) and other pristine lakes of the Wilderness. The project would include a discharge of untreated water from the mine cavity, significant impacts to three threatened species and their habitat (grizzly bear, bull trout, and lynx), and the diversion of a perennial stream. Other elements of the project include a land application of mine wastewater and the creation of a mountain of tailings contained behind a massive dam. Surface facilities also would include a milling facility and support structures. The Kootenai National Forest and Montana Department of Environmental Quality (DEQ) recently released a Supplemental Draft Environmental Impact Statement (SDEIS) for the proposed Montanore mine. The EIS can be found at: http://www.fs.fed.us/nepa/nepa_project_exp. The EIS analyzes the impacts of four different mine alternatives, including the no-action (no mine) alternative, and five electrical transmission line alternatives, also with a no-action (no transmission line) alternative. The permitting agencies are now accepting public comments on the proposal. The comment period closes on December 21, 2011. The proposed Montanore mine would be an underground copper/silver project with an above ground tailings impoundment and processing facilities constructed on lands in the Kootenai National Forest 18 miles south of Libby, Montana. Similar to the proposed Rock Creek mine, the Montanore mine would extract ore from beneath the mountains, meadows, and alpine lakes of the Cabinet Mountains Wilderness. encompass 2,030 acres. In addition, the proposed project would require the construction of approximately 16 miles of high-voltage electrical transmission line to power the mining operations. The permitting process for the Montanore Project began in 1989 when Noranda Minerals obtained a permit to construct an exploration adit in the Libby Creek drainage just outside the wilderness. In 1991, Noranda halted construction of the 14,000-foot adit when the amount of nitrate pollution generated from blasting operations degraded Libby Creek. A state directive mandating the construction of a water treatment facility, combined with low metals prices led the company to abandon the project. Today, the company currently pursuing a permit to construct the mine is Mines Management, Inc. (MMI)/Montanore Minerals Corp. The future of the Cabinet Mountains Wilderness depends upon all of us. Four underground tunnels or adits would be used to access and move the ore from beneath the wilderness, or serve as a ventilation source. An exploratory adit reaching the ore body would be located along Libby Creek just outside the wilderness. 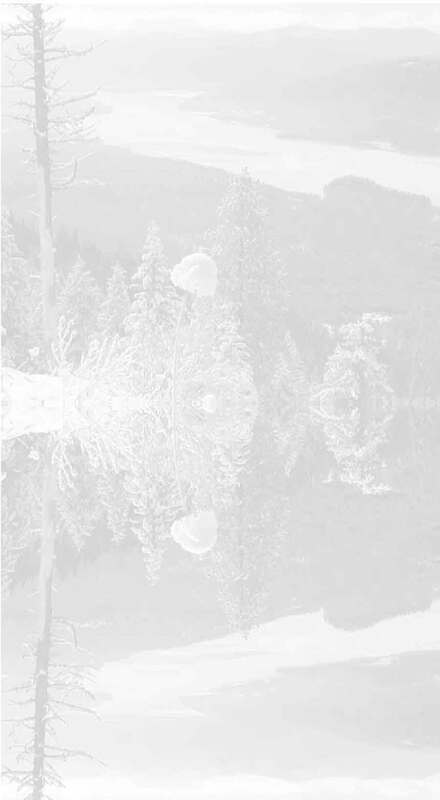 A ventilation adit would be constructed above Rock Lake, an alpine lake located within the wilderness. Mine wastewater would be treated and discharged to groundwater adjacent to Libby Creek. The discharge would not meet current water quality standards for nutrients and metals, but would be allowed to degrade the quality of the receiving waters. In 1992, at the request of Noranda Minerals, the state issued an order that would permit an increase in the concentration of certain pollutants discharged to surface water and groundwater above current water quality standards as defined by Montanas 1971 nondegradation statute. The 19-year order still stands despite changes in water quality standards, best available technology, and new findings related to the impacts of the mine. Other discharges of mine wastewater would include untreated water from the mine cavity that would escape to groundwater through highly fractured rock, and seepage from the tailings impoundment to groundwater. Pollution from the mine would require long-term monitoring and treatment. Under the permitting agencies preferred alternative, 120 million tons of mine tailings would be conveyed from the underground mine via a pipeline to be stored in an impoundment between Poorman Creek and Little Cherry Creek. The tailings impoundment would require the construction of a dam to contain the massive volume of mine tailings and waste rock. The dam would be 320 feet high, 10,650 feet long, and consume 675 acres of National Forest Land. The surface area available for the deposition of 120 million tons of tailings would be insufficient, resulting in the need for a higher dam that could affect the stability of the dam. The agencies conservatively estimate the chance of a catastrophic failure of this tailings impoundment to be as high as 1%. The impacts from this failure would be the loss of the entire Libby Creek Watershed. Toxic sediment would fill Libby, Poorman, Bear, and Ramsey Creeks, destroying the bull trout habitat in these streams. The metal-laden sediment would eventually be deposited into the Kootenai River potentially threatening the habitat of bull trout and the extremely rare white sturgeon, a species that has survived since the time of the dinosaurs. Seepage from the tailing facility would have the potential to be acid generating and the EIS states that effects on groundwater quality beneath the impoundment are unknown. The area of the proposed mine encompasses two major watersheds: the Clark Fork River Drainage and the Kootenai River Drainage. One of the greatest impacts from the mine would result from massive dewatering of wilderness lakes and area streams in both drainages as a result of the inflow of ground water into the underground mine cavity and tunnels (adits). While rain and snowmelt replenish some of the water in area streams, most of the recharge comes from groundwater. By diverting ground water into the man-made mine void, the lakes and streams would be deprived of the water critical to maintain their flows and delicate water chemistry. The EIS states that groundwater drawdown and related changes in stream flows will be greatest at the end of mining and during the long post-closure phase. Modeling of the hydrologic impacts predicts that flows would be reduced in East Fork Rock Creek, Rock Creek, East Fork Bull River, Libby Creek, Ramsey Creek and Poorman Creek. Groundwater levels would not recover until reaching a steady state 1,200 to 1,300 years after mining ceased. A significant portion of the East Fork of Bull River and the East Fork of Rock Creek would be completely dewatered for centuries. The East Fork of Bull River provides habitat for most productive bull trout population in the Lower Clark Fork Bull Trout Recovery Area. This cold-water stream has the deep pools the species requires to spawn and survive. It is expected that after mine closure in 30 years, the East Fork of Bull River would lose 100% of its ground water recharge, resulting in the disappearance of this pristine wilderness stream. The East Fork of Bull River would not reestablish most of its pre-mining flows until approximately the year 3200. Bull trout would be long gone. The East Fork of Rock Creek flows from Rock Lake through the Rock Creek Meadows until converging with the West Fork to form the Main Stem of Rock Creek. Along the way, the creek and the groundwater create wetlands that make Rock Creek Meadows unique and productive habitat for wildlife and fish. Bull trout and Westslope Cutthroat thrive here. The proposed Montanore mine would transform the East Fork of Rock Creek into a dry channel by diverting all of the groundwater that currently flows to the stream. Rock Creek Meadows would become parched in summer resulting in the loss of the bull trout and westslope cutthroat populations. The main channel of Rock Creek cannot survive without the significant water contribution from the East Fork. The controversial and legally contested Rock Creek mine already threatens Rock Creek with the introduction of massive amounts of sediment, and with heavy metals. Now, the struggling stream and its fragile bull trout population face threats from this additional mine. The Montanore mine would dry the lower reaches of Rock Creek for long periods of time. The waterless sections of the stream would be expected to expand, rendering Rock Creek virtually useless to migrating bull trout. The volume of groundwater flowing into Rock Lake and St. Paul Lake also would be reduced. Some of the most drastic impacts would be to Rock Lake, which sits almost on top of the ore body that would be mined. The water table surrounding Rock Lake would lowered by as much as 1,000 feet. Not only would groundwater recharge be cut off, but the mine void would also siphon water from this wilderness lake causing it to slowly drain. It would be 1,000 years before groundwater flows would be expected to return to pre-mining levels. St. Paul Lake already suffers from low water levels in very late summer. During the dry summer months, groundwater would no longer be available to help maintain its water levels. The lake would depend solely on snowmelt and rain for recharge. As a result, St. Paul Lake would be transformed into a pond that begins to dry up shortly after winter snowmelt disappears. North of Rock Lake nested between Elephant and Ojibway Peaks are the Libby Lakes. These three pristine lakes sit virtually atop where the proposed mine cavity would be located. The mining company claims that these lakes are outside the region of groundwater impacts because of their high elevation. Others who dont have such a vested interest in the mine see it differently. The loss of these remote and incredibly pristine waters would be unacceptable. The mined out cavity would require almost 500-years to fill and the regions groundwater would not reach pre-mining levels for almost 1,300 years. Until that time, places like Rock Lake and the East Fork of Bull River would be shut off from the water that that have always depended upon. The proposed Montanore Mine would result in significant impacts to three threatened species and their habitatGrizzly Bear, Bull Trout, and Canada Lynx. The proposed Montanore mine would displace grizzly bears from approximately 25,000 acres of habitat. Industrial activities associated with the mine that would drive grizzly bears from their range include blasting of numerous mining tunnels, road building, and construction of a mill facility and tailings impoundment. It would be impossible to compensate or mitigate for this scale of habitat loss. Grizzly bears would either be driven from the region altogether, or begin using substandard habitat where conflict with people would increase. Individuals that crossed over the ridge line into the Rock Creek and Bull River drainages would be faced with the prospect of future mine development from the proposed Rock Creek mine. The Rock Creek mine would displace grizzly bears from an additional 7,000 acres, exacerbating habitat loss. Direct habitat loss, disturbance, and increased poaching would all raise the rate of mortality for this already struggling population. 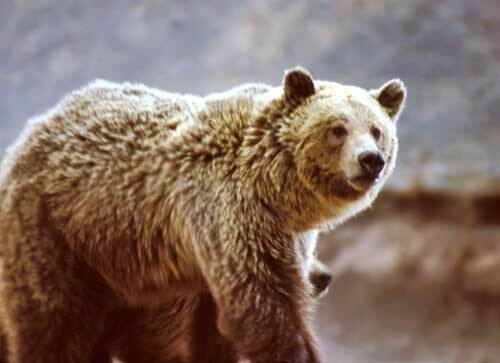 Under current habitat conditions without either mine, grizzlies have not met the criteria that the US Fish and Wildlife Service believes is necessary for their recovery. The population shows excessive female mortality and there is a 78% probability of continued population decline. The impacts from Montanore alone, and cumulatively with Rock Creek, would likely drive the bear to extinction. Native bull trout, a species listed as threatened, are found in the streams that would be dewatered by the mine. Bull trout require clean, cold water with deep pools for spawning and rearing. The drastic stream dewatering that is predicted would impair bull trout spawning by degrading or eliminating habitat. Significantly, the mine would impact critical habitat that has been identified as necessary for the recovery of the species. Designated critical bull trout habitat is found in Libby Creek, Rock Creek, and East Fork Bull River. Introduction of sediment into area streams from construction of roads and the transmission line, as well as heavy metals from mine effluent, would further degrade bull trout habitat. Lynx were listed as a threatened species in 2000. The Kootenai National Forest is within a core lynx area. The EIS largely dismisses impacts to Lynx, but long-term losses of lynx habitat are expected to occur as a direct consequence of the Montanore mine. It is unknown how tolerant lynx are to disturbance, but increased traffic and human activity has the potential to restrict movement of this carnivore. Construction activities would eliminate some of the lynxs food base by reducing prey, and snow compaction on roads and trails could increase competition for food from other carnivores that would normally be restricted by deep snow. The risk of mortality from vehicle collisions would increase considerably over present levels, and easier access to lynx habitat would raise the risk of incidental trapping mortality. 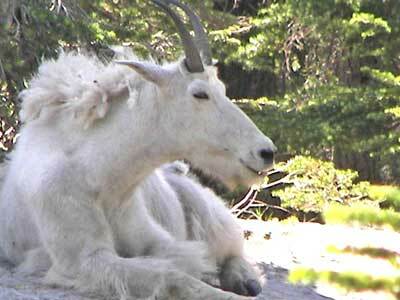 Other wildlife species that would be substantially impacted from the mine include Rocky Mountain Goat and Wolverine. Mountain goats and wolverines would be impacted primarily by disturbance. It is anticipated that surface and underground blasting, road building, transmission line construction, and helicopter use would create stress for goats and lower their reproductive success. The cumulative effects from the Montanore mine, the Rock Creek mine, and other proposed mines including the Wayup mine, would magnify the impacts and could cause intolerable stress. To escape the noise and human activities, goats would be driven from the area, resulting in increased mortality and the potential loss of the Rock Creek herd. Wolverines would be driven from denning habitat due to blasting and helicopter use during construction of the adits and transmission line. The elusive carnivore also would suffer increased mortality as a result of human encroachment into wolverine habitat. Wolverines are extremely rare, and it is expected that they will be listed under the Endangered Species Act in the near future. Both Westslope Cutthroat Trout and Interior Redband Trout would be affected by loss of habitat from dewatering. Westslope occur in many of the drainages in the project area. Pure populations of interior redband trout are found in Libby, Bear, Little Cherry Creek, Poorman, and Ramsey creeks, and in the Fisher River. Both species are listed as Sensitive Species. The Kootenai National Forest is 2.2 million acres; the 94,000-acre Cabinet Mountains Wilderness is the only protected wilderness in this forest. The Montanore projects mining operation would be located inside the Cabinet Mountains Wilderness. As a result, impacts to wilderness lakes are anticipated when the mine cavity diverts the groundwater these lakes depend on for recharge. Rock Lake, St. Paul Lake, and, quite possibly, the high alpine chain of Libby Lakes would be impacted. Wilderness streams and creeks would also be subject to the effects of groundwater diversion, including the East Fork of Bull River, which is essential for the survival of the threatened bull trout in the region. Once the mine cavity beneath the wilderness is created, the consequences cannot be reversed. Subsidence or collapse of the subsurface cavity and tunnels occurs frequently in the industry. If that failure were to happen beneath the wilderness, surface impacts could be expected. Noise and visual impacts would reach well into the Cabinet Mountains Wilderness. Noise related impacts would be created by the blasting of rock, heavy truck traffic, and the constant operation of heavy equipment, generators, and ventilation fans. Blasting of the evaluation adit would generate noise louder than a jet engine. Under the agencys preferred alternative (Alternative 3), noise levels would increase up to the ridge between Elephant Peak and Ojibway Peak. The mine would create 24/7 industrial lighting, all well within visual range of the wilderness, with significant impacts to the night sky. Visual impacts to the wilderness would include a massive tailings pile, 16 miles of power line construction, the presence of industrial equipment and facilities, and a ventilation adit adjacent to Rock Lake. Both the mine and transmission line would diminish wilderness qualities and reduce the opportunities for solitude. Visual and noise impacts would continue through the 16-19 year life of the mine. These impacts would not only be significant for wildlife, but also would seriously affect the wilderness experience sought by hikers, wildlife enthusiasts, hunters and fishers. The cumulative noise and visual impacts to the Cabinet Mountains Wilderness from the Montanore and Rock Creek mines would likely overlap and would be extreme, driving out both wildlife and humans who seek the solitude and wildness that is associated with wilderness. Impacts to air quality would include cumulative impacts associated with the neighboring Rock Creek mine. The wilderness has a Class One Airshed, meriting the highest level of protection. Air pollutants would include discharges of particulates (PM10), nitric oxides, and sulfur dioxides. Many species depend on the Cabinet Mountains Wilderness for regional survival. The grizzly bear, lynx, wolverine, and mountain goat will suffer massive habitat degradation and increased mortality. The loss of the opportunity to view these species further diminishes the wilderness experience for many people. The Montanore mine singularly and in combination with other proposed mines, especially the Rock Creek mine, would impact regional water quality, threatened species, key fisheries and wildlife populations, and the integrity of the Cabinet Mountains Wilderness. When considering impacts of a proposed project, the US Forest Service is required by law to take a hard look at the cumulative impacts of multiple projects. In its analysis of the Montanore mine, little consideration was given to cumulative impacts, yet the Rock Creek and Montanore mines would be in close proximity of each other. Montanores Rock Lake Ore Body abuts the Rock Creek Ore Body and is separated by a fault running through the mountain range. Mine facilities and tailings piles would be only a few air miles apart (See Map). To see the big picture, the permitting agencies must look at the cumulative and additive impacts from both of these proposals and other anticipated projects in the region. The proposed 10,000-ton-per-day copper and silver mine is located approximately 13 miles northeast of the town of Noxon in northwest Montana. 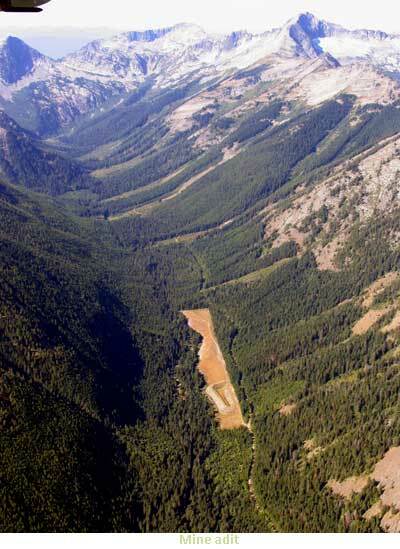 The majority of the mine would be constructed and operated on Kootenai National Forest land adjacent to and beneath the Cabinet Mountains Wilderness Area in the Rock Creek drainage of the Cabinet Mountains Range. In the midst of what is now remote and generally undisturbed forest land, the Rock Creek Mine would create a major industrial facility including the mine itself, a railroad station, pipelines, a power line, a mill site, a tailings treatment plant, and associated infrastructure operating 24 hours a day for an estimated 35 years. The mine would cause a major influx of people into the largely undisturbed Rock Creek area. The area where the mine would be located now offers habitat for a number of rare and sensitive wildlife species, including the harlequin duck, the fisher and the wolverine, and, in particular, three federally-listed threatened species; the grizzly bear, lynx, and bull trout. 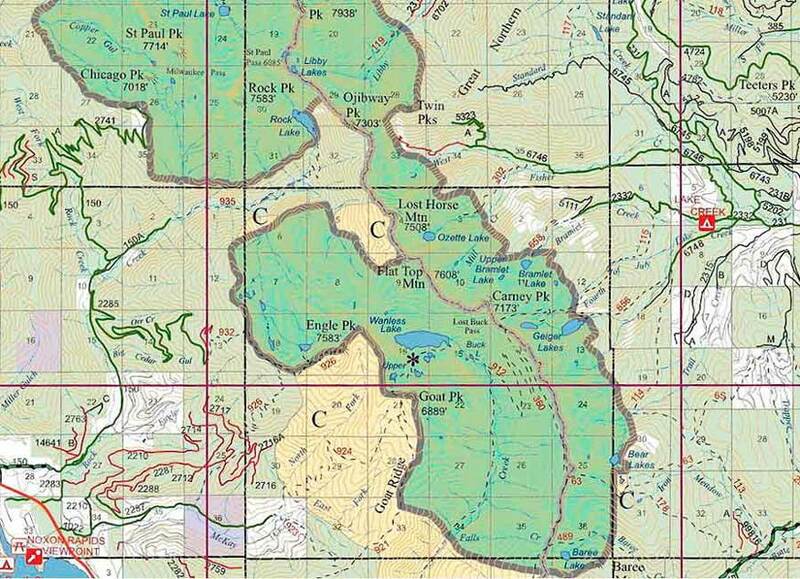 The Fourth of July mine is located adjacent to the wilderness boundary, near Lower Geiger Lake (see Forest Service map). The U.S. Forest Service recently authorized motorized access to the Fourth of July mine site. The access road to the Fourth of July patented mine parcel will contribute to the constriction of the north-south movement corridor and risks of adverse encounters between grizzly bears and people will increase. The U.S. Fish and Wildlife Service concluded that these roads would have significant adverse effects on grizzly bears. 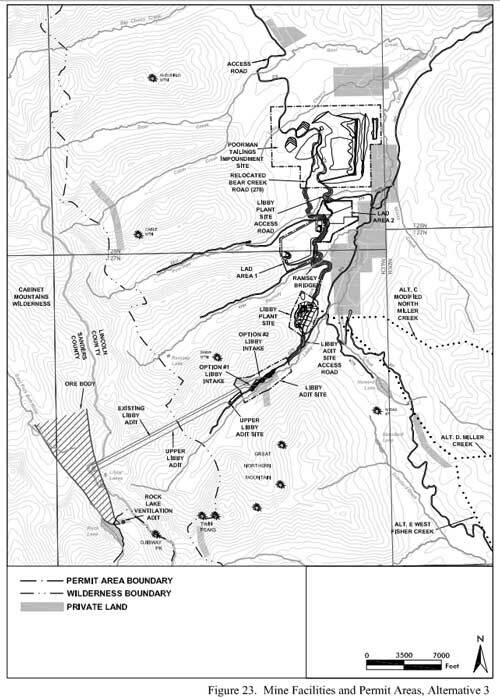 The Way-up Mine is located in the headwaters of West Fisher Creek east of Ojibway Peak (see Forest Service map). This patented mining claim also threatens the wilderness and will contribute to pinching off the north-south movement corridor for grizzly bears. This mining claim is located near the narrow passageway that separates the north and south portions of the Cabinet Mountains Wilderness. More than a dozen other patented mining claims occur in the corridor between the east and west sides of the southern Cabinet Mountains.